Aquila Corporation is compliant with all required Federal and State licenses and registrations, including the FDA, CMS, and the CE Mark for European Standards Performance. 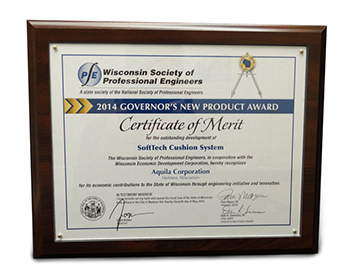 2015 – Aquila won the best in state 2015 Engineering Excellence Award for a second time from the Society of Professional Engineers for the new SofTech wheelchair cushion system. 2013 – Aquila was the subject of a clinical study in a peer-reviewed journal called “Infectious Diseases in Clinical Practices“. The study summarizes our wheelchair cushion’s proven ability to treat boils on the posterior for the test subject, a wheelchair user. 2012 – Aquila was invited to present our powered wheelchair cushions to staff at the Department of Health and Human Services National Institute of Health. We received high praise from the attendees. 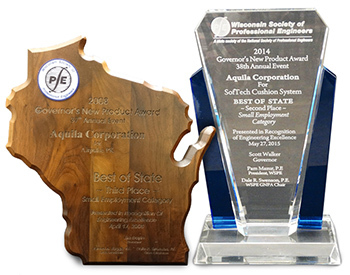 2008 – The Governor’s New Product Award for Engineering Excellence was presented to Aquila for the Airpulse PK wheelchair cushion system. It was presented by the Wisconsin Society of Professional Engineers for product excellence, which reflects engineering initiative and innovation. *Our HCPCS code does not guarantee reimbursement. Insurance companies make their own determination on coverage or reimbursement. Aquila does not file any insurance paperwork. To learn more, click here.